Manama is much like any modern European city – with palm trees – and Islamic architectural touches. Overall, it is quite attractive, criss-crossed with wide boulevards whose median strips are covered with palm trees and flowers. Bahraini architecture is gentler than the ultra-modern architecture you see in Europe and America, making use of an odd Arabic sort of decoration that is kind of like Victorian gingerbread, but simpler and more elegant. To me, at least, it is far more subtle and much more pleasing to the eye than either our modern or traditional designs. It has become apparent to me that they have accomplished something quite unique here: The old and the new architectures blend very nicely. In Europe and America, new buildings clash horribly with old ones. Here, new buildings, for the most part, look better than old ones, but they echo older styles (without simply imitating them) and fit together with them harmoniously. For example, across from my hotel are what look like four identical apartment houses. Or they will be identical when the last two are complete. They are about four storeys high, and each appears to cover about a city block. The finished ones are a light lavender in color, with white trim. They look elegant without being garish – the lavender color notwithstanding. Another example of the architecture severely tests my ability to put into words what I am seeing and experiencing here. The first time I went out in search of the National Museum, I found it, but it was closed. Further up the road, however, was the art museum — and a very special restaurant. 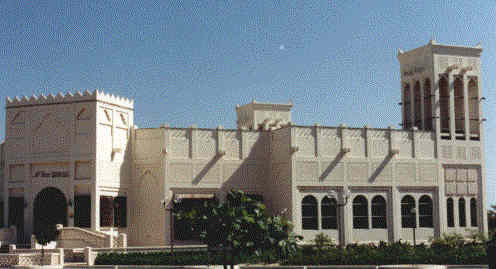 The Al Sawani restaurant was built only a few years ago by the Bahraini Government, and is run by them. 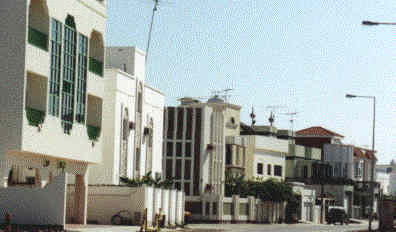 The architecture was specifically selected to be representative of Bahraini style. And it is exquisite. It is a sandy-colored building that stands by itself, mostly one storey tall, but with square "wind towers" on three of its four corners. These towers are a Bahraini invention for promoting air circulation within. It is decorated in Islamic style, with simple but decorative geometric touches throughout. Normally, I am not big on excessive decoration, but the interior of the restaurant was, well, just right. The ceiling was waffle style, with each square being perhaps a meter or so to a side, and a beautiful mosaic pattern inside. There are wrought iron filigreed arches at the entrances to the restaurant and the bar. (The bar is called the "launch" because islamic countries aren’t allowed to have "bars".) The carpet, the furniture, the walls – all are done exactly right. I explained to the Maitre ‘d that I was just visiting and wanted to see the inside of the building, and he was most hospitable. I asked for a cappuccino, which he got for me, but later he didn’t charge me for it. He did show me the menu, and the prices were quite reasonable. A few weeks later, my client took me to dinner there. The food was most interesting. Lots of lamb and yogurt. Strange food, this, but not bad!